You’ve seen the pictures of people wearing face masks to prevent catching the H1N1 swine flu. If you’re going to wear a mask, why choose plain blue? People in Japan wear masks out in public all the time, for colds, the flu, and hay fever. Japanese mask-wearing citizens demand the finest quality, menthol cool wet-filtered, nonstick lipstick-ok face masks. 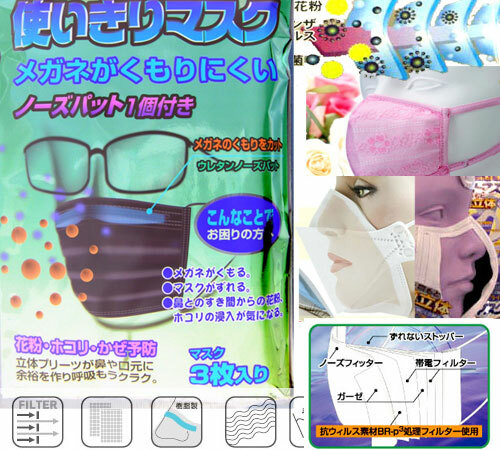 From single-use to 7-day to designer fabric wash-and-wear masks, the most fashionable, technologically advanced flu face masks are in Japan. Click here to see all the photos,including the green tea mask and the nose-wire mask.